This questpack modpack is meant to be a cross between a super grindy, super hard questpack & an easier pack for new modded and casual players. With 82 mods and more than 800 quests across 2 questbooks, this modpack has accomplished what no other modpack has: Made a super long questbook designed for potato-ish computers. But don't worry, this pack is not just for the new players. If you love modpacks that challenge you with custom recipes and give you so much of a challenge that it barely makes sense anymore and you end up forgetting what you're trying to build halfway through, this pack is your perfect pack! For example, to make the Nether Star Generator x64 from Extra Utilities, which you are required to make, you need over 4,000 stacks of basic Survivalist Generators (or 57,000 stacks of iron!) That is an actual recipe. This questbook is all inclusive so all players will have a part of the questbook that seems just for them. So whether you are a farmer, techie, explorer, pvper, adventurer, or anything else, you will have quests in that genre of the game. This modpack is also being regularly updated to keep quests coming! With each major update, there will most likely be an entirely new questline for you to play around in, although you will have to unlock it first if you haven't already. This pack is meant to be played long-term and take you over many months so I try to create custom recipes for some items that I think are just a smidge too easy to get your hands on. So, I tried the command, in game and on the console, and both times no change happened. It even said that no such command exists. I looked in the config of the mod and saw a setting called "SeverSync" set to false, saying something along the lines of "This will make the questing book compatible with servers" I set it to true and still got nothing. Any more ideas because i'm out! I forgot about this, but if you think you have fixed it please tell me!! Minecraft crashes instantly after launching? "The coremod codechicken.core.launch.CodeChickenCorePlugin does not have a MCVersion annotation, it may cause issues with this version of Minecraft"
"Process crashed with exit code -1073740791"
0 quest for all the them. I’ve restarted my Minecraft hundreds of times, do I possibly have to instal this modpack all over? I am trying to craft a jeweled apple from tinkers construct and am following what it says in nei, but it wouldn't let me craft it. Im sorry to ask, but can you update this modpack to 1.10.2 or higher? I know it is hard to do. I cannot play on it I can only play on modpacks 1.10.2. One of my major regrets for Questing Mayhem is not making it a 1.10.2+ pack when I initially made it. Despite this, no, I will not be updating this modpack to another version of Minecraft. This is simply because if I did, I would have to completely remake the pack from scratch. I'm sorry if this sounds selfish, but I've been working on Questing Mayhem for over 3 years now, and I am not going to just throw all that work out. Sorry for the inconvenience. Out of curiosity, why can you not play modpacks that aren't 1.10.2 or higher? I may be able to help. There are no resource packs made for this pack, so any resource pack you use, you will have to download all of the texture packs for all the mods and then combine them in a folder. Despite that, many of the "best" and most well-known resource packs are available for almost all of the mods in Questing Mayhem. (i.e. Sphax, faithful, sortex etc.) If you want more detail on how to download texture packs and make it so all the texture packs work together in Questing Mayhem, ask me or look up tutorials. There should be plenty on Youtube. Hope this helps. I got to the craft a Jeweled Apple quest with my friend so just one question How do? This is simply due to lag. Most likely on the server's end. Since you are playing LAN, there is not much you can do except decrease lag in your world and/or get better machinery to play Questing Mayhem on. I always recommend downloading the Optifine mod and installing it into Questing Mayhem for peak performance. It is easy to do and usually increases FPS tenfold. If you would like, I can tell you how to do it and give you instructions on how to decrease lag. Let me know. What version of optifine i should use with this modpack? 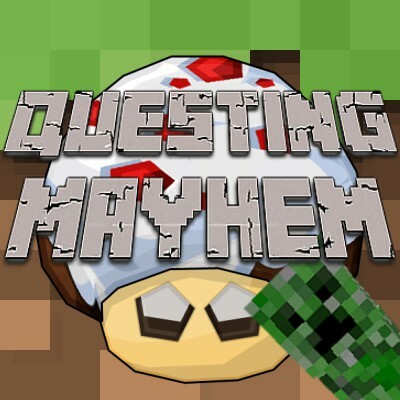 Questing Mayhem is a modpack on Minecraft version 1.7.10, so you'll want to download and run any version of Optifine that is for 1.7.10. Hope this helps. Let me know if you have any questions. I can't create a world with this modpack. Creating a World will make the game crash. Yes, 0.14.1 is currently broken. I have a possible solution and will release another update very soon. This may or may not fix the problem. Sorry for the inconvenience. Is the modpack supposed to be played in the standard Minecraft world or The Skylands? If it is skylands Maybe add something in the modpack description to specify that. Questing Mayhem can be played in either a normal world or a skylands world. You should be able to complete all the quests/play the pack in either world type. Hope this answers your question. My questbook can't detect that i crafted the 1k ME storage cell, i've tried so many times and it won't work. Yes, the ME storage cell quests are bugged in the most recent version and will not complete for anyone. If you have cheats enabled on your world, type /hqm edit in the chat and you will get a book that will allow you to click any quest to automatically complete it. If you do not have cheats enabled, go to options and open your world to LAN. In the LAN settings, enable cheats. Sorry for the inconvenience.